You may have heard by now that The Ghost Room is closing but it hasn't closed yet! That's one, of many, reasons you should make the trip down to 4th street tonight. If you've been reading this site for as long as I've been writing it then you know that I'm a fan of Bill Baird, he's the dude behind Sunset and was once a member of, the now defunct, Sound Team. Well, now you need to be on the lookout for Blank Fritz. 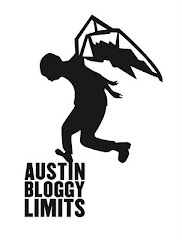 It's Baird's newest project and I'm going to say tonight at The Ghost Room is Austin's first chance to see Blank Fritz. I'm not entirely sure that's true but I'm going with it. 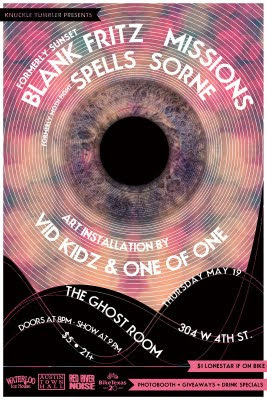 Cover for tonight's show is a mere $5 and Ghost Room drinks are inexpensive and powerful. Also, the room sounds impeccable they don't get a lot of good bookings so when they do you should make the effort to check it out. Like I said the room won't be around much longer, chances are you can already buy a condo on spec that will soon be where the venue is. In addition to a new moniker for Sunset, in the form of Blank Fritz, the band formerly known as Moth Fight! will also be performing with their new moniker Spells. Personally, I think "Moth Fight" was easier to google than Spells but "Blank Fritz" is WAAAAY easier to google than "Sunset". If you're thinking of forming a band you should consider how easy your band's name is to google. Even if you're anti-technology and only want to release your music on 8-track, we bloggers use search engines to write about your band sooooo, yeah make it easier for us to find you. I mentioned how the drinks are inexpensive well, guess what? If you bike to the show tonight they'll give you Lone Star for a $1. Just let the bartender smell you, that should be proof enough. Check here for full details on tonight's show including give-aways, video projection and other musical acts.